Sydney the oldest, biggest, and most beautiful of all Australian cities, lies amid a seductive intermingling of land and sea. Glide along the glittering harbor on a ferry, see the white sails of the Opera House gleaming in the sunshine, admire the graceful arch of the Harbour Bridge, and it’s hard to imagine this vibrant state capital of New South Wales was once a convict colony. In 1788, it was at Sydney Cove where Captain Arthur Phillip, commander of the First Fleet, established the first British colony in Australia. 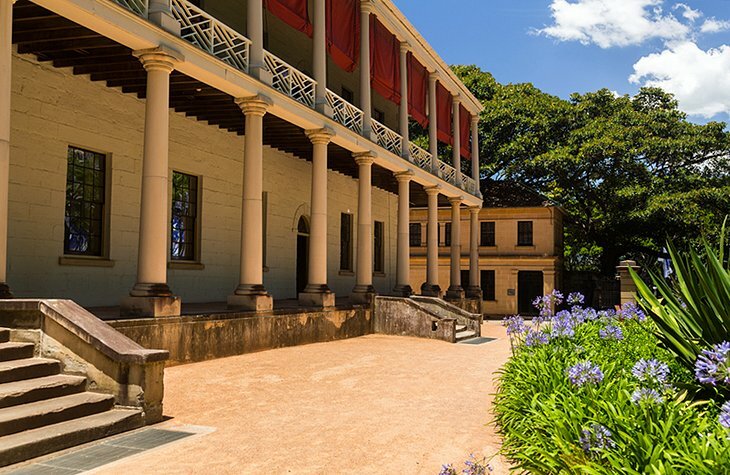 Today, you can explore Sydney’s fabled history in the narrow, cobbled laneways and historic buildings of the Rocks and the city’s excellent museums, where you can also learn about the Gadigal aboriginal people, who once thrived on this land. Sydney still fizzes with the adventurous spirit of its settlers. You can climb the harbor bridge, surf the green-barrel breaks at Sydney’s golden beaches, or fly over the city on a scenic tour. Wildlife-rich wilderness areas surround the city providing appealing day trip possibilities. One of the world’s great icons, the Sydney Opera House is a UNESCO World Heritage Site and the star attraction on the glittering harbor. This graceful building, shaped like shells or billowing sails, perches on a finger of land surrounded by water. Snap a photo while gliding by on a harbor cruise, relax at one of the restaurants, stroll around its exterior, or take an organized tour of this magnificent structure, which encompasses theaters, studios, exhibition rooms, a concert hall, and cinema. 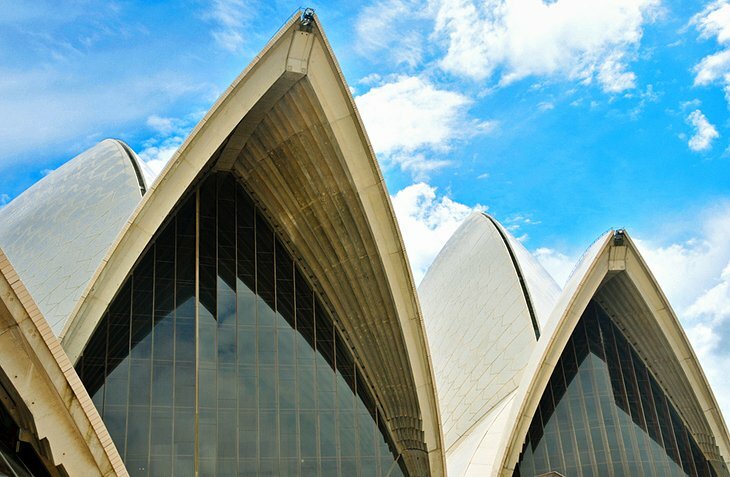 Book a Sydney Opera House Guided Walking Tour to learn about the history and get a behind-the-scenes look at this famous building. This is a flexible ticket that allows you to join any one of the tours throughout the day, departing every half hour from 9am to 5pm. Avid photographers head to Mrs Macquarie’s Chair for one of the best photo opportunities. Note that the building is currently undergoing a $202-million upgrade, slated for completion in early 2021, but it will continue to operate during the restoration. The Sydney Harbour Bridge or “Coathanger,” as locals call it, was the city’s best-known landmark prior to construction of the Sydney Opera House. 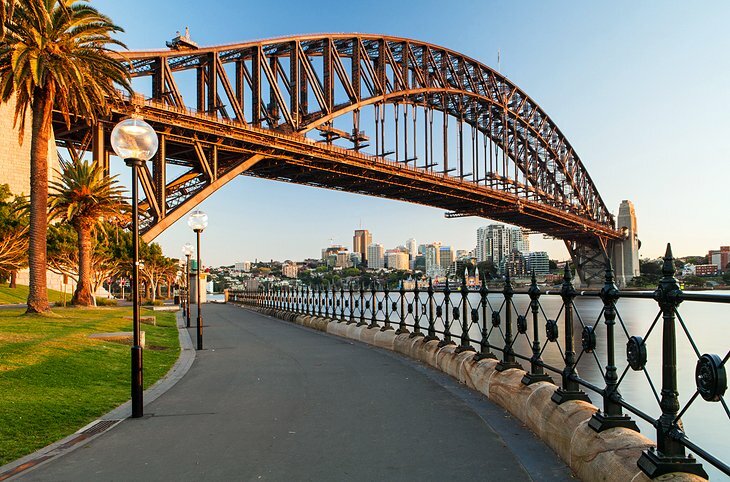 Supported by massive double piers at each end, it was built in 1932 and remains the world’s largest steel arch bridge, connecting the harbor’s north and south shores in a single curve rising 134 meters above the water. Along its length run two railway lines and eight lanes for road traffic, the direction of which can be varied according to traffic flow. Increasing bridge traffic encouraged construction of a harbor tunnel in 1992 to ease congestion, but motorists can still drive over the bridge for blue-water views. Pedestrians can stroll across on walkways or join a guided ascent through BridgeClimb for a breathtaking panorama of the city and harbor. To learn about the fascinating history of the bridge’s construction, visit the museum in the southeastern pier. Daring souls who want to climb to the 135-meter-high summit can book the Sydney BridgeClimb. This is a spectacular opportunity that takes groups of up to 13 people on an approximately 3.5-hour climb to the top of the outer arch. Tours run throughout the day, beginning with a dawn climb and ending with a night climb. 1.5-hour Sampler Climbs and 2.25-hour Express Climbs are also available. On a tongue of land protruding into Sydney Harbour, the Rocks historic area was once home to the Gadigal aboriginal people and later became the country’s first site of European settlement. The name of the Rocks comes from the rocky coast on the west side of Sydney Cove, where the convicts pitched their tents. Today, more than 100 heritage sites and buildings jostle along the narrow streets, including Sydney’s oldest surviving house, Cadman’s cottage, built in 1816. First stop should be a visit to the Rocks Discovery Museum, which traces the area’s fascinating transformation from traditional aboriginal lands to convict slum to tourist hot spot. Afterwards, wander around the narrow cobbled streets with their souvenir shops, restaurants, cafés, and aboriginal and contemporary art galleries, or shop at the market stalls. Guided tours run the gamut from aboriginal heritage walks to photographic excursions and nighttime ghost tours. Built by convict labor in Sydney Cove, bustling Circular Quay is now home to the city’s main ferry terminal. Thousands of commuters flood the area at peak hours, cafés and restaurants line the waterfront, and street performers entertain locals and visitors along the sunny walkways. 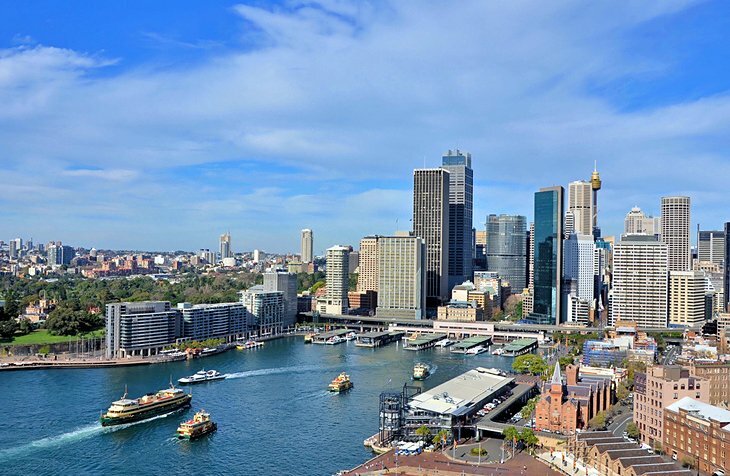 One of the most popular things to do here, and the best way to appreciate Sydney’s sparkling waterfront setting, is to hop aboard a harbor cruise, like the popular two-hour Sydney Harbour Coffee Cruise. Ferries also depart from here to prime spots, such as Manly, Watsons Bay, and Taronga Park Zoo. During the annual winter migration, the Sydney Whale-Watching Cruise take passengers out past Sydney Heads to view these magnificent creatures. 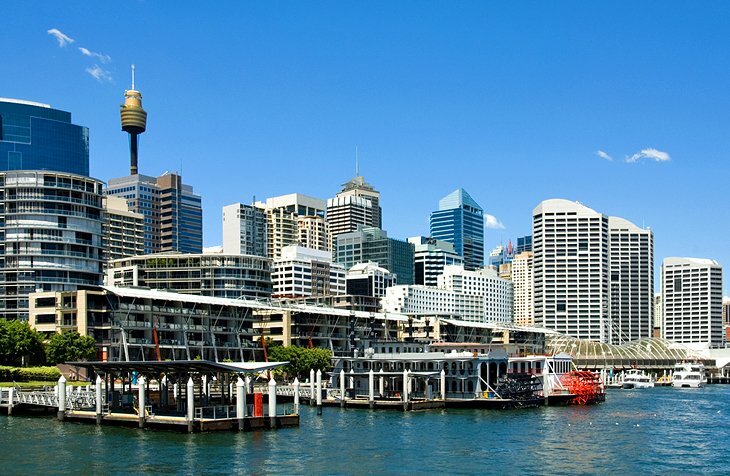 You can easily walk from Circular Quay to other top attractions. Head south along the waterfront promenade to the Sydney Opera House and the Royal Botanic Gardens, and a short walk to the north leads to the Sydney Harbour Bridge and the Rocks historic area. To the west, the free Museum of Contemporary Art, housed in an Art Deco building, displays cutting-edge, and often controversial, exhibitions. A hub for tourists and locals alike, Darling Harbour is a waterfront pedestrian precinct packed with shops, restaurants, museums, exhibitions, and entertainment venues. Families will love Madame Tussaud’s; the WILD LIFE Sydney Zoo; and the SEA LIFE Sydney Aquarium, which contains the world’s largest collection of Aus tralian marine creatures. The SEA LIFE Sydney Aquarium Entrance Ticket is a great way to get ahead of the crowds and it also offers discounts on other attractions. Powerhouse Museum offers interactive exhibits on science, technology, design, and history, while nautical-minded history buffs can board a replica of Captain Cook’s ship, Endeavour, at the Australian National Maritime Museum. Younger children will love the carousel, playground, and water park. An IMAX and 9D theater, harbor jet boat rides, simulated flights and racing car adventures round out the exciting attractions. Those seeking a tranquil patch of green amid all the excitement can slip into the Chinese Garden of Friendship and sip tea among the willows and koi ponds. 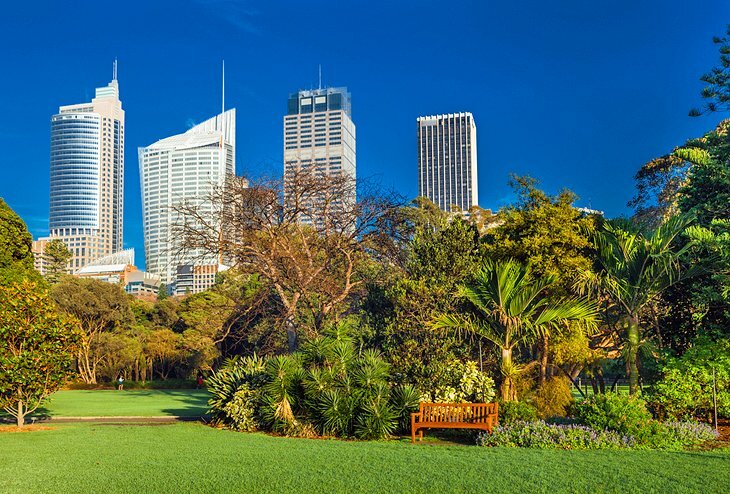 A tranquil oasis amid the hustle and bustle of the city, the Royal Botanic Garden at Farm Cove lies a short and scenic stroll along the waterfront from the Sydney Opera House. The gardens were established in 1816 and encompass 30 hectares of themed gardens with towering trees, palm groves, orchids, ferns, and flocks of fruit bats. Visiting the gardens is one of the many wonderful things to do in Sydney for free. Among the highlights are the Palace Rose Garden, which includes some 1,800 roses, and the Glasshouse Latitude 23 and Fernery, brimming with tropical foliage, begonias, and orchids. For the less energetic, a hop-on, hop-off train tours the grounds. After exploring the gardens, you can relax at the café or restaurants, or enjoy a hillside picnic with beautiful harbor views. Surrounding the gardens is the Domain, a popular event venue, with open green space and sports areas, and while you’re visiting the gardens, you can enjoy views of Government House, the official residence of the governor of New South Wales. 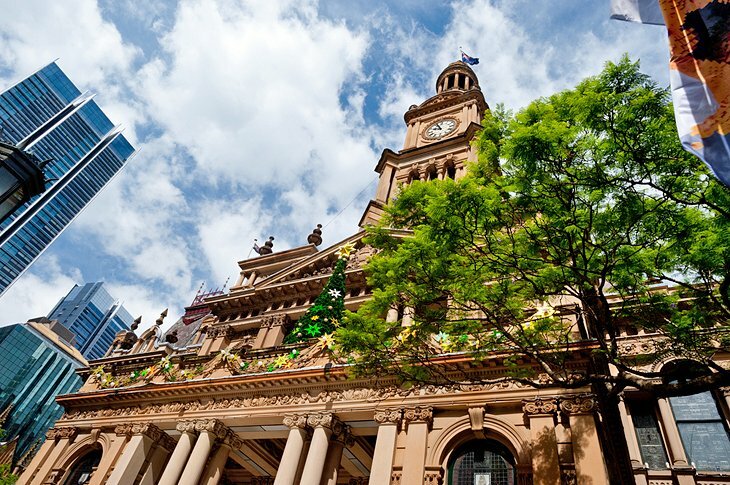 A high point of Sydney shopping is the Romanesque-style Queen Victoria Building (“QVB”), linked by underground arcades with Town Hall Station. Originally built as a market hall between 1893 and 1898, this elegant building is crowned by a high central dome surrounded by 20 smaller domes. After decades of neglect and even plans for demolition, this grand sandstone building was restored to its original state in the early 1980s. Today, more than 200 high-end shops line its light-filled galleries. It’s worth a visit, even for those who shun the shops, just to admire its successful restoration, as well as its beautiful stained glass windows and mosaic floors. The Tea Room QVB hosts a High Tea under crystal chandeliers here that is popular with locals and visitors. 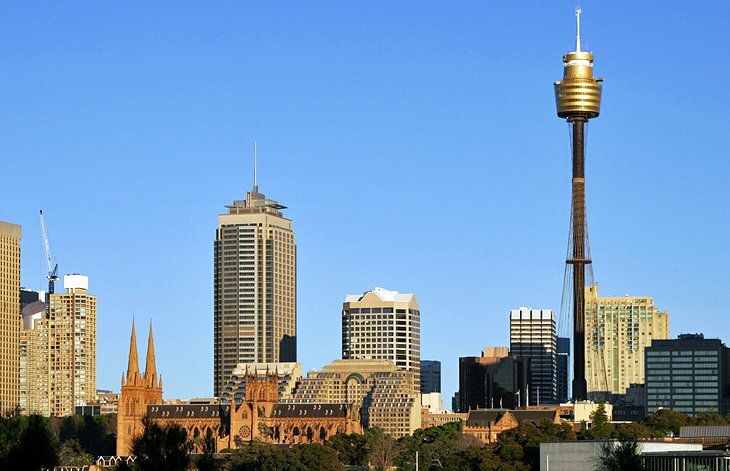 Soaring above the city skyline, the 309-meter-high Sydney Tower Eye is the city’s tallest building and one of its great landmarks (other than the Opera House and Harbour Bridge, of course). This golden spire-topped turret rises from the busy Centrepoint shopping mall. Express lifts whisk visitors to the observation deck at the top, or to SKYWALK, an alfresco glass-floor viewing platform, the perfect spot for sightseeing. 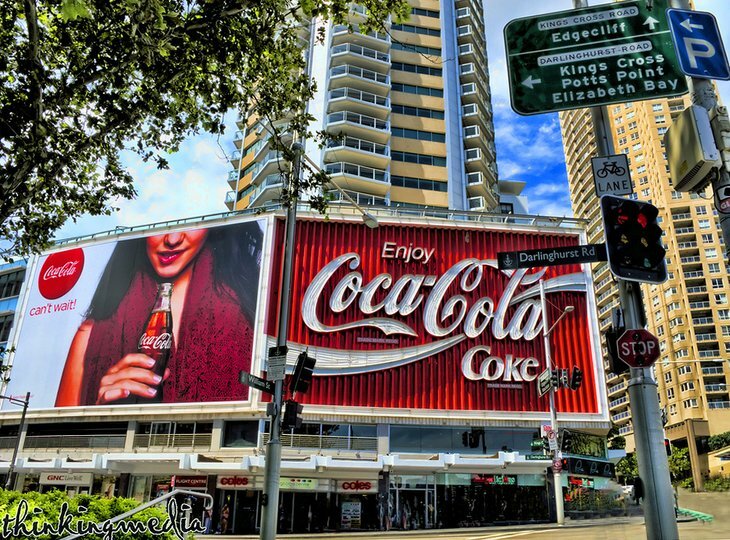 While up there, you can enjoy panoramic views of Sydney and its surrounding suburbs or enjoy a bite to eat at one of the revolving restaurants or the café. Also on offer is a 4D cinema experience, which provides an overview of the city’s major icons. Sydney is famous for its fabulous beaches. Tucked around the harbor are many sheltered coves with calm water and sugary sands. Less than a 15-minute drive from the city, iconic Bondi Beach beckons with its great surf, café scene, and cosmopolitan vibe. For fantastic ocean views, take the coastal walk along the cliffs from Bondi to Coogee. Other ocean beaches include Cronulla (the only one easily accessible by train from the city), Bronte, Tamarama, and Maroubra. A 30-minute ferry ride from the city, Manly is a favorite seaside destination with its beachfront promenade, netted ocean pool, and excellent shops and restaurants. Farther north from the city, surfers will find some fantastic breaks at Collaroy, Dee Why, and Narrabeen. Swimmers should stay between the red and yellow flags. Volunteer lifeguards patrol the surfing beaches on the Pacific during the summer and run popular lifesaving competitions. Barangaroo Reserve is an excellent example of a successful urban renewal project and a lovely spot for a walk along the harbor. Transformed from an unsightly container terminal, this 22-hectare waterfront precinct opened to the public in 2015 and is now home to more than 75,000 native trees and shrubs, walking and cycling tracks, shops, restaurants, and event and exhibition space. It is named after the influential female indigenous leader at the time of European colonisation. 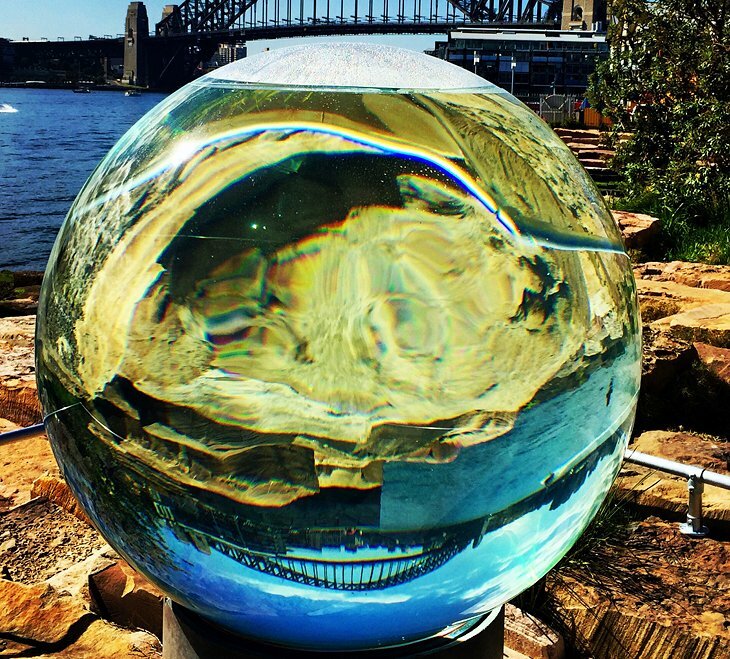 One of the most popular things to do here is the Wulugul Walk, a scenic waterfront promenade that skirts the six-hectare re-created Sydney Harbour headland at the reserve’s northern end and will eventually extend for two kilometers between Walsh Bay and Darling Harbour. Along the way, you can admire an evocative series of public art installations. Keep an eye out for shell wall, a 22-meter-tall vertical panel on the side of a building at the reserve’s southern gateway, created by two of Australia’s leading indigenous artists. You can learn about the area’s rich indigenous heritage on an Aboriginal cultural tour. The reserve is a four-minute walk from Wynyard station, and you can also catch a ferry direct to the new Barangaroo Wharf. 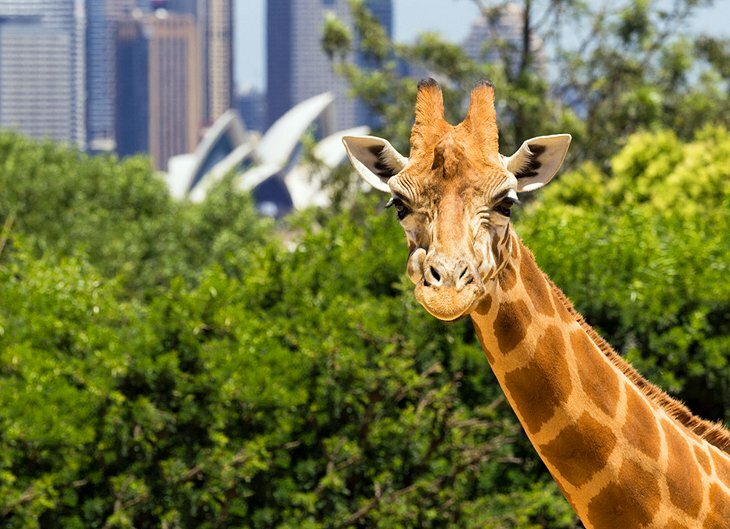 At Taronga Zoo, you can enjoy close-up encounters with iconic Aussie wildlife and other animals from around the world, plus superb views of the Sydney skyline. Nestled on a point along the north side of the harbor, the zoo inhabits prime Sydney real estate in the posh suburb of Mosman. Highlights include the Lemur Walk-Through, Koala Encounter, and Seal Show. From the city, buses to the zoo depart from Wynyard. Better still, hop aboard a ferry at Circular Quay. The zoo’s lively events calendar includes “Roar and Snore” overnight zoo stays and a summer concert series. 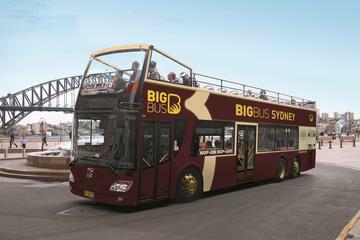 You can purchase a Sydney Taronga Zoo Entry Ticket in advance, which includes a ride on the Sky Safari gondola. The oldest street in Australia, George Street was once a nameless track trodden by convicts fetching supplies of water. Today, it’s one of the city’s major traffic arteries, where high-rise office blocks, shops, and historic buildings converge in an incongruous jumble. An architectural highlight is the elegant Romanesque-style Queen Victoria Building replete with graceful domes, stained glass windows, and high-end stores. 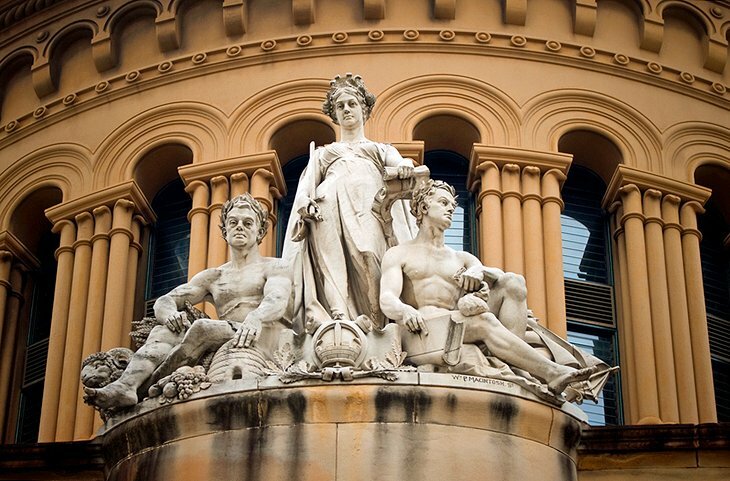 Nearby, the Sydney Town Hall (1869) is a major city landmark sporting a medley of architectural styles (it’s been compared to a richly decorated wedding cake). Another architectural standout is the neo-Gothic St. Andrew’s Cathedral, completed and consecrated in 1868. Shoppers will find plenty of stores in the area. Designer boutiques and jewelry stores line the Victorian-style Strand Arcade, while Pitt Street Mall, one block east from George Street, is one of the city’s major shopping precincts. Amid all the din of the central business district, Hyde Park is a sanctuary of sprawling lawns, shady picnic spots, flowers, fountains, and fig trees. Like a mini Central Park, this welcome patch of green, named after Hyde Park in London, offers prime people-watching – especially at lunch when city workers come here to kick off their shoes. 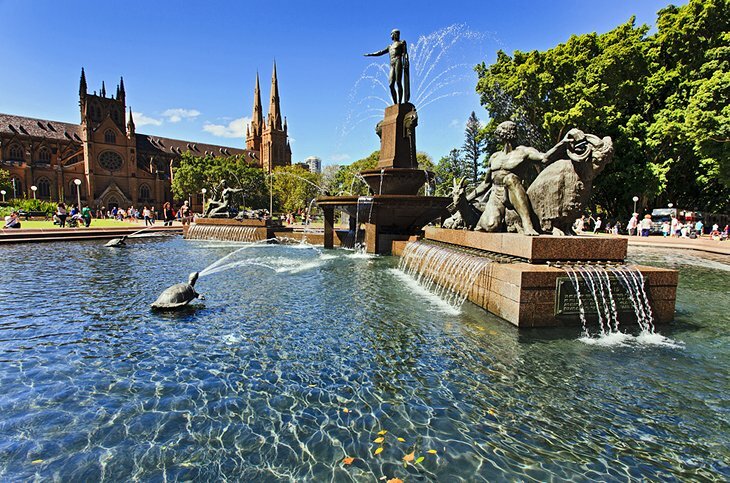 The park’s bronze Archibald Fountain (1932) commemorates Australia’s alliance with France during WWI, while the Art Deco Anzac War Memorial (1934), in the southern half of the park, honors its victims. At the north end of Hyde Park, in Queens Square, are three fine Georgian buildings, masterpieces of the convict architect Sir Francis Greenway: Hyde Park Barracks, St. James’ Church, and the Supreme Court. Built by convict labor in 1817-19, Hyde Park Barracks was restored to its original condition in 1975-84 and now houses a museum on the history of Sydney portraying the lives of the first involuntary “settlers.” On the east side of Hyde Park is the Australian Museum, with the largest natural history collection in the country. 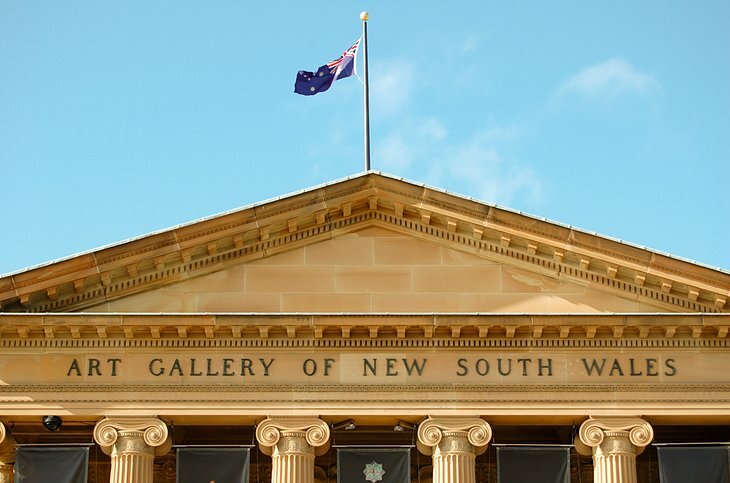 Surrounded by beautiful parklands, the Art Gallery of New South Wales is one of the country’s most distinguished art museums. The building dates from 1885 and houses spacious, light-filled galleries and Grand Courts, with collections ranging from works by the European masters and Asian artists to evocative contemporary art from around the world. The gallery also houses one of the largest collections of aboriginal art in Australia. After admiring all the masterpieces, you can relax at the café or restaurant, or browse the gallery gift shop. Facing Hyde Park, St. Mary’s Cathedral (1868-82) is a symbol of the spiritual beginnings of the Catholic Church in Australia. 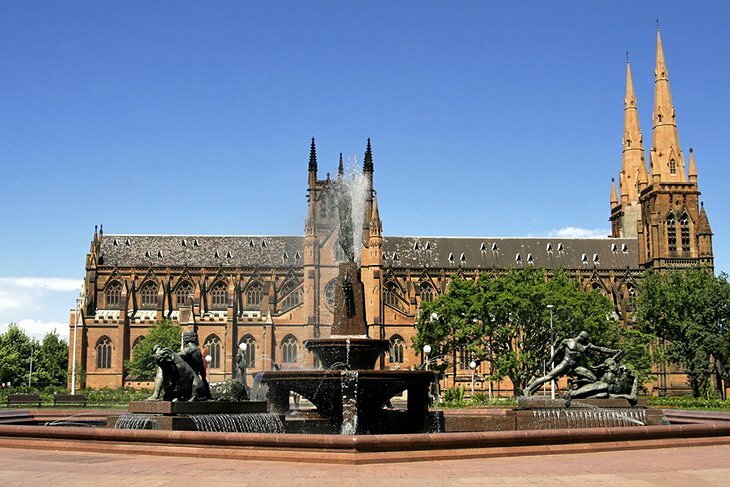 This striking landmark, in neo-Gothic style, is the seat of the Archbishop of Sydney. Topped by twin spires, the building was modeled on Lincoln Cathedral, and its imposing façade reflects the design of Notre-Dame in Paris. Inside the cathedral, intricate stained glass windows cast beautiful patterns of light. Christmas is an especially evocative time to visit, when the cathedral is adorned with lights and decorations. Stretching from Hyde Park in the south to the Sydney Opera House in the north, Macquarie Street was once Sydney’s most fashionable street. Governor Macquarie commissioned the construction of many of the colony’s grand public buildings along this strand, some designed by convict architect Francis Greenway. Impressive sandstone residences soon followed, with verandas to capture the beautiful views of the surrounding parklands and Sydney Harbour. In 1816, the completion of Sydney Hospital on Macquarie Street encouraged doctors to set up offices nearby. But the hospital’s capacity exceeded demand, and legislative offices moved into some of its buildings. Today, Parliament House occupies the hospital’s northern wing and is open to the public when the New South Wales Parliament is in session. The old Sydney Mint inhabits the hospital’s southern wing, which is now home to a library, central courtyard, and café. Also on Macquarie Street, is the State Library of New South Wales, the oldest library in Australia. Among its jewels are the journals of Captain Cook and Joseph Banks as well as Captain Bligh’s log from the Bounty. 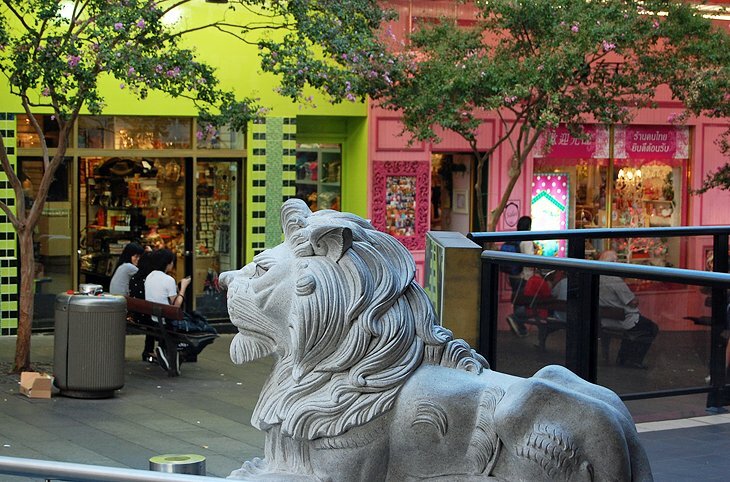 Inhale the fragrance of sizzling Szechuan spices, shop for Chinese specialty items, or feast on authentic Asian cuisine at Sydney’s Chinatown. Framed by lion gates at each end, this small district lies in the pedestrian zone of Dixon Street between Darling Harbour and Central Station. Yum cha is a popular pastime here, and the Friday night market is a feast for the senses with everything from dim sum and Vietnamese pho to teppanyaki. On the first full moon after January 21, the streets of Chinatown come alive during the celebration of the Chinese New Year. Near Chinatown, Paddy’s Markets, is a Sydney institution from Wednesdays through Sundays with hundreds of stalls selling fresh produce, bargain fashions, and souvenirs. Luxury Accommodation. Deluxe hotel options include the harborfront Park Hyatt, one of the country’s top hotels; the sumptuous Shangri-La Hotel; and the Four Seasons; all with stunning harbor views. Mid-Range Accommodation. 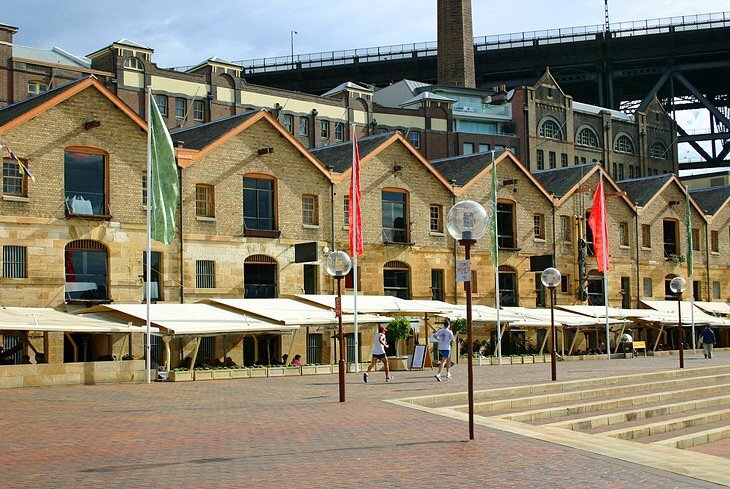 The boutique Harbour Rocks Hotel welcomes guests in a cozy converted warehouse close to Circular Quay ferry terminal. For families and travelers seeking apartment-style accommodation, Quay West Suites is a top choice, while the Marriott Sydney Harbour at Circular Quay sits a little closer to the bustling malls of the city center. Budget Accommodation. For cost-conscious travelers, The Australian Heritage Hotel and The Mercantile Hotel offer affordable rooms in a superb location. In contrast to the regular and spacious layout of the younger Australian cities, Sydney is a complicated maze of one-way streets and narrow lanes. Public transport or tours are highly recommended for first-time visitors. See the Sights: For the best introduction to the sights of Sydney, book a Sydney and Bondi Hop-On Hop-Off Bus Tour, which stops near the major sights in the city center, around the harbor, and Bondi Beach. Tickets are valid for 24 or 48 hours, and passengers can get off and on the bus as often as they please. Take a Day Trip: Just a short drive outside the city is some spectacular mountain scenery. 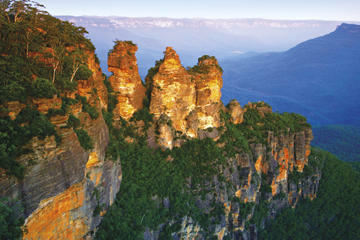 If you have time for just one day trip, take the Blue Mountains Nature and Wildlife Day Tour from Sydney. This small group tour provides pickup and drop-off from your hotel, lunch, entrance fee to the Featherdale Wildlife Park, and a guide. One of the most beautiful cities in Australia, Sydney is surrounded by plenty of enticing day trip destinations. The World Heritage-listed Blue Mountains has some of the best hikes in Australia; the beautiful Hunter Valley is a hot spot for foodies; and Canberra, the nation’s capital, is only a three-hour drive away. 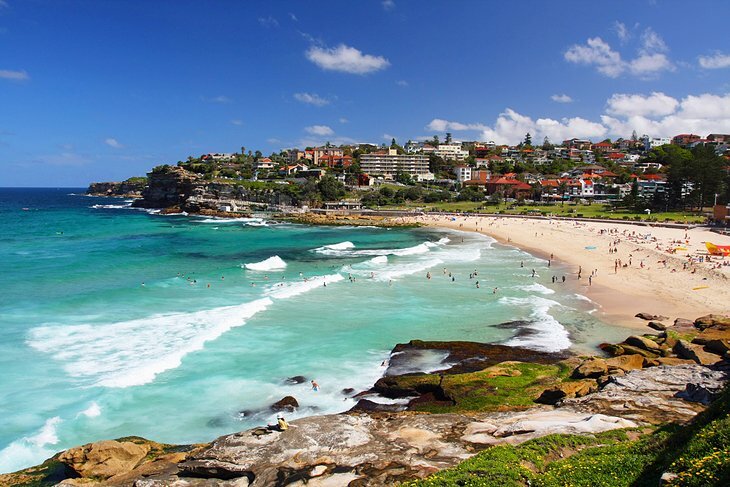 A short hop from the city center, you can also bask on the golden shores of Sydney’s best beaches, including Bondi Beach, one of the top-rated beaches in Australia. For hotel recommendations and ideas for where to base yourself, check out our Where to Stay in Sydney page. If you need help planning your trip, see our articles on Australia’s top itineraries, exciting outdoor adventures, and best fishing destinations.